Brooks Adrenaline GTS 17 are stability cushioned running shoes. 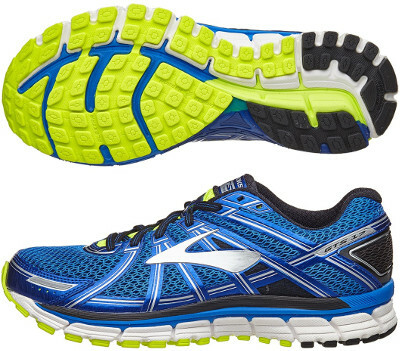 The Brooks Adrenaline GTS 17 is the annual update of the popular Go-To-Shoe saga from american brand based in Seattle. Its popularity comes not only from well-known blend of plush cushioning and stability (intended for medium/severe pronation) but also great value for money. Positioned between premium Transcend 3 and versatile Ravenna 7, it is a perfect choice for running long distances. There is available a New York City (NYC) very limited edition. No major changes compared to its predecessor Adrenaline GTS 16, just an upper upgrade which looks more stylish with breathable dual layer mesh for good breathability and reordered fused overlays for snug and secure fit. Reinforced toe cap brings extra consistency and increases protection against external elements. Cushioning is somewhat softer in the Adrenaline GTS 17 and full length segmented crash pad (with double groove in midsole wall) improves flexibility and delivers smooth transition. Pronation control relies on Progressive Diagonal Rollbar which basically is a tri-density midsole (multiple levels of material hardness) with an internal post (including TPU for extra rigidity) for a more natural and efficient gait cycle. Outsole design has slightly changed with smaller lugs in the inner zone for improved flexibility and traction. Blown rubber is used in mid and forefoot while harder one (HPR+) is present in more exposed areas for longer durability.